I’m envious of anyone who can knit or crochet and make those oh-so-cute cup cozies. Really I am. My mother was an avid knitter and my daughter is too, but for some reason that hobby never took hold of me. Now it’s kind of like the piano lessons that I found boring as a child – I wish I had kept with it. I do sew, but sometimes I just want to craft without dragging out the sewing machine and all of its assorted paraphernalia . 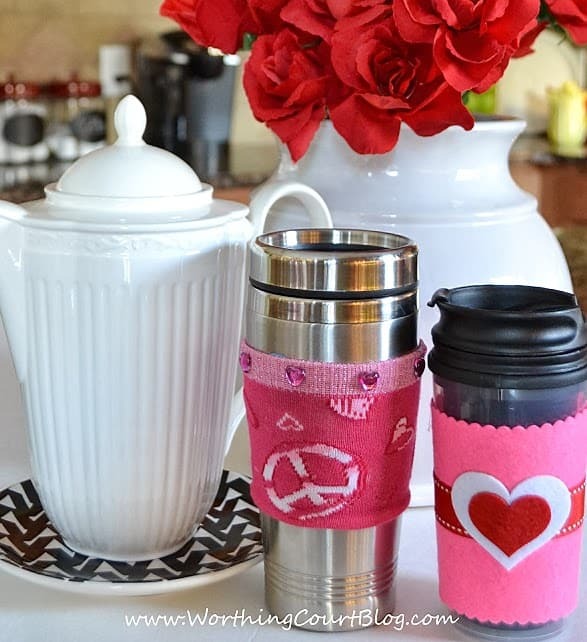 So today, I’m here today share two versions of no-sew, no-knit cup cozies. I made these for Valentine’s Day, but you can change the colors and embellishments to go along with any holiday or time of the year. First up, let’s talk about a cozy for a shapely, curvy travel mug. You know the type – maybe it bulges in all the wrong places. 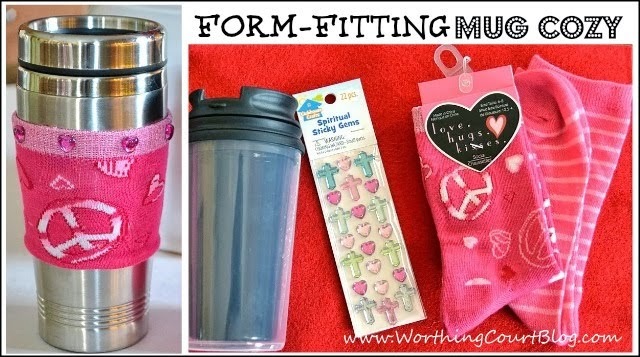 In those cases, you need a form fitting cozy that will stretch and take on the shape of the mug. A mug – it doesn’t have to be a shapely one. 1. Slide the sock over the mug to determine how tall the cozy needs to be. Allow about 1/2″ extra each for the top and bottom edges and make a mark. 2. Cut the sock at the marks that you made. *Note that my sock already had a decorative top, so I chose not to cut it. 3. Fold the raw edges under and secure with fabric glue. 4. When the glue is completely dry, the cozy is ready to slip back onto the mug. 5. Add the embellishments. I found it easier to embellish the cozy while it was on the mug. Next up, is a cozy for a mug that has straight sides. This one doesn’t need to stretchy. 1. Create a template for the cozy by wrapping a piece of paper around the mug and sketching the shape as you go. Make sure that you make the template long enough to have overlap on the backside. I found the easiest way to make a template was to lay the mug on its side on top of the paper and sketch with a pencil as I rolled the mug completely over. 2. Lay the template onto the sheet of felt and trace around it. Cut the template out using the pinking shears (or regular scissors if you don’t want a decorative edge). 3. Wrap the cut piece of felt around the mug. Run a bead of hot glue under the edge where the felt overlaps. 4. Cut a piece of ribbon long enough to wrap around the mug. Include extra for overlap. 5. 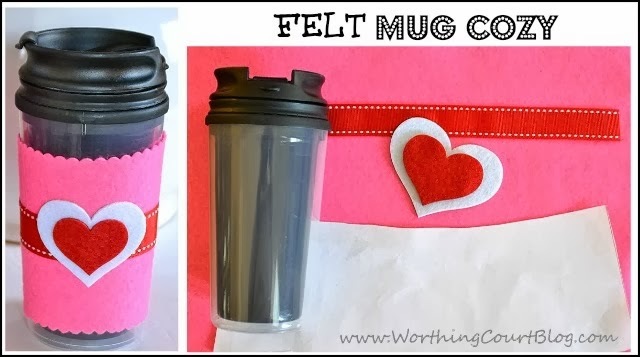 Wrap the ribbon around the mug and hot glue under the edge where it overlaps. 6. Cut hearts out of felt and hot glue those on top of the ribbon. These will make great gifts for teachers or friends! Looking for more Valentine’s Day inspiration? 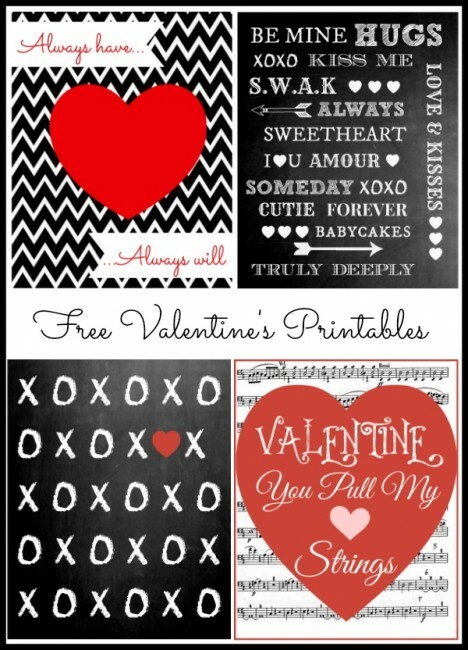 Here are 4 Free Valentine’s Printables. 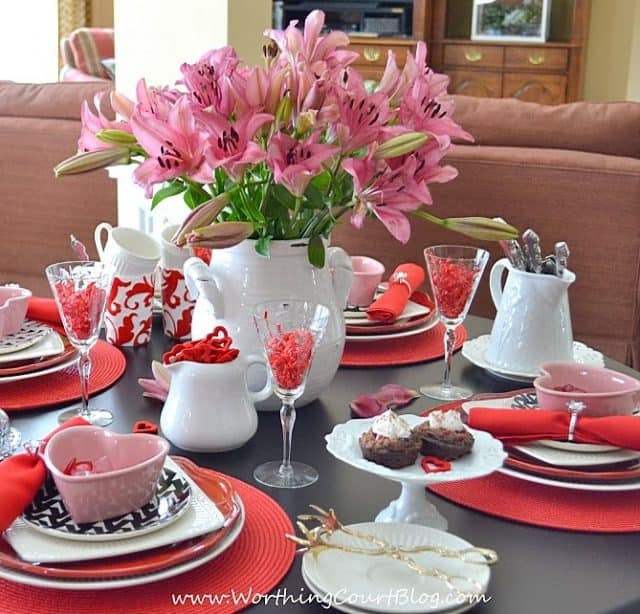 You can check out my Valentine’s Day Decor too. Suzy, these are so darn cute! I love the idea of using a sock. Very very clever! I’m going to be looking for a leopard sock and make an animal print cozy for myself! So so adorable! I would have never thought of a sock! Love the felt one too. I’m glad this Valentine’s showcase is behind us…I’m ready to move on to spring!